The Chess game, is supposed to be a fight between the creative ideas of two individuals. It’s now becoming (at least for professionals) more like a game of memorization. This is a direct consequence of continual refinement of technique and assimilation of knowledge, opening theory. Computers and Engines playing Chess became so strong that a simple program running on a smartphone can beat the world champion. Getting rid of the vast array of opening theories will certainly help keeping the true values of chess as a spiritual fighting game. The idea behind Musketeer Chess, is to bring minimal but meaningful changes to the rules of the game of chess, maintaining as much of the present game as possible and eliminating “undesirable” features like the over-analyzed starting position and opening theory. 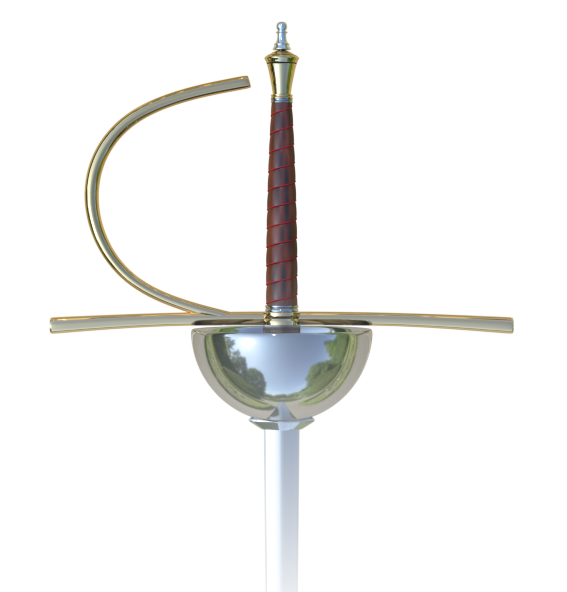 This website introduces Musketeer Chess, but also many other Chess Variants. Musketeer Chess inspiration came from a well known Chess Variant, named SEIRAWAN Chess (or SHarper Chess). The game was first was invented in 2011 and evolved regularly to the current version, and is the fruit of endless hours playing and testing on the Board. Like the game of Chess, an 8×8 Board and a Classic set of pieces is used to play Musketeer Chess. The main change is adding 2 new pieces with unique rules (and unique recognizable design) to the classic set of pieces. These new pieces bring: endless new tactical shots, much more strategies, unbalanced games helping to have spectacular and short games, reducing the draw percentage. We also get rid of long opening memorization because we have 90 different piece combinations to start with (and 45 different pairs of pieces), not to mention the different possible placement positions of these additional pieces. This reduces the importance of opening preparation and emphasizing again the inventiveness on the board. The game is still a game of chess: we can get inspiration from known openings and ideas, after trading the new pieces we finish the game with the classic pieces like a normal game of chess. Some general principles are still important, but should be further adapted to new strategies. LEOPARD, CANNON, ELEPHANT, HAWK, UNICORN, FORTRESS, SPIDER, DRAGON (or AMAZONE), CHANCELLOR, and ARCHBISHOP. Some of the pieces can be customized inter changing tops. To handle with extreme care as the pieces can break easily in such a case. The Spider basis can be a piece for itself. It’s bigger than the Knight and Bishop. It looks like a Rook. This piece explains more easily to children’s that the Rook is worth more than Bishop or Knight (naturally depending on the position). My kids barely understand why a more valuable piece looks smaller than the Bishop or the Knight (which is the case in the majority of the modern chess sets). The Cannon can be customized adding the Spider top. Here is a picture from the online playing program. It’s available for you for free, and will help you test strategies, and try our game. In the near future, NextGen Pawns will be available. Play online with the 7 new Variants using the NextGen Pawns. NextGen Pawns are a trial to make the Pawn play a bigger role in the game. 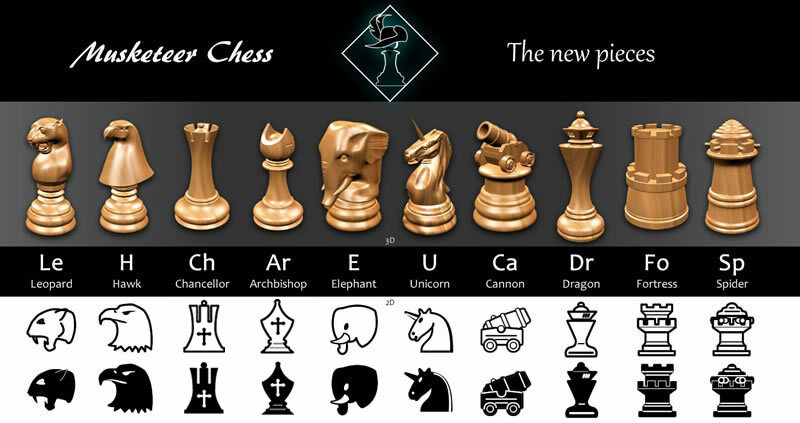 Not only the rules evolved, but also each NextGen Pawn is a unique easily recognizable design. You can already try our games online: Lutetia Chess featuring the Musketeer or General, Moscovia Chess featuring the Lieutenant or Guardian etc. 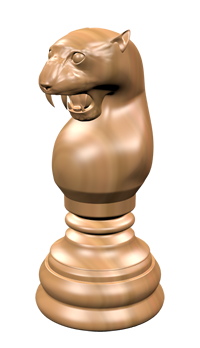 There are 7 different NextGen Pawns: General or Musketeer, Raven or Colonel, etc. You can try the new rules for each NextGen Pawn on our Online Gaming Zone. As Philidor said, Pawns are the “soul of chess”. It’s a difficult task not to alter the beauty of the game of chess when messing with the pawns. I think that some of the trials we made are pretty interesting. Please share your thoughts on our forum. We will also release Musketeer Chess Series 2 and 3, featuring many new unique figural pieces (Mammoth, Griffin, Wolf, Lion, Rhinoceros, Bear, Lioness etc.). You can suggest the rules of these pieces by joining the discussion in “chess dot com forum”. In the next chapter we will detail the Rules of Musketeer Chess. We will also give you our relative value of the Musketeer Chess Fairy pieces. We will also show some typical tactics and endings with the new pieces: Musketeer Chess, End Games. Don’t hesitate to start and participate to our discussions on our forum.